It is a rare and wonderful honor to send out a 20 Questions Tuesday to an Internet artist friend of mine, Khoi Pham. 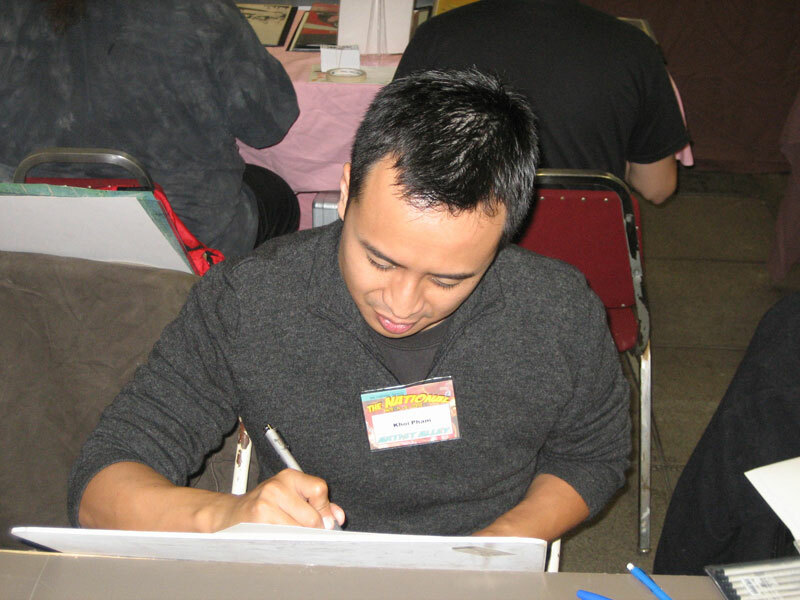 Khoi is known for his work on Mighty Avengers, Hercules, and X-Men: Legacy. I met Khoi on the Interwebs through my Internet home away from home, Ten Ton Studios. He is a very giving artist and a joy to interact with. I also was lucky enough to sit down with him for some dinner at the 2010 Mid-Ohio ComicCon. I do seriously consider myself very lucky to have met Khoi and get the chance to interact with him regularly. Since Khoi has kind of exploded onto the comics scene, he has been interviewed ad nauseum about what got him into comics, who his favorite character is, his drawing methods (you can google those on your own), etc… I will attempt to eschew the tired questions which can be found online at various comic book sites, and pose some questions that he most likely has never been asked in an interview. And I want these bad boys to be seriously random. 1. If you had to choose between ice cream and pie (and you could not choose pie a la mode) which would you go for? Pie. I don’t scream for ice cream. 2. I know, since you are constantly on the clock to produce pages upon pages of comic book art, and then subsequently on the hook for going to conventions and getting commissions from fans to draw as well, that you most likely do not get much opportunity to go on vacation. If you could go on a vacation, where would you go? Hmm. I’ve been so busy with family and work that vacation never crossed my mind. I really can’t think of any one place, especially for more than a few days, so perhaps 4 day weekends at a bunch of different locations. As long as my wife Heather’s with me, it doesn’t matter the destination. 3. I know that it is sometimes very difficult to follow your passions. I also know that you were a practicing attorney of some shape or form prior to making the jump to comics as a full time gig. Did you get much pushback from family (parents or partner) for walking away from a paying full time career to go after your passion? At first the idea was met with raised eyebrows, then that turned into suggestions about how I should be the next Scott Adams (of Dilbert fame). The transition was actually not that abrupt. I was a practicing attorney while drawing for Marvel for a few years. As the comic work increased, the decision to drop lawyering was pretty simple. I do miss lawyering on occasion, especially my colleagues and coworkers, but there is simply not enough time in the day. I’d do both still if I could. 4. You have children and I have children, and I know that there are things I have said that I told myself I would never say. What parenting actions have you done that you told yourself you would never do? I told myself that I would never drone on and on with my lectures, but I find myself doing that. It’s a work in progress. 5. What is your favorite genre of food? I like a variety of foods, so picking a favorite is difficult. I know that Vietnamese food is a favorite standby for us when we’re out of ideas, but then, so is Indian food and sushi. French is nice, too, although I haven’t had it in a while. 7. Did you play any sports when you were growing up? If so, what position? If not, what extra-curricular activities did you do? I played a lot pickup basketball growing. Total hoops rat, but my parents never let me play organized sports. They’re crazy controlling Asians like that. Instead, I did student government. I also spent a lot of youth playing guitar in rock bands. 8. Are these questions random enough? Have you been asked any of these? Should this be considered a 3 parter? Sufficiently random, thanks! Interviews do get pretty tedious at times, so these questions are nice. And no, I’ve never been asked these. 9. Do you have a studio that you go to or do you work from home? Either way, what color are the walls of your work space? I work from home. I wish I had a studio to go to, but that’s not doable right now with kids everywhere. I have a designated work station, but I prefer to grab a drawing board and work in the dining room. Kids bother me less when they can see me. Weird. 10. So… Push pins or thumbtacks? wait that is a really stupid question. Don’t answer it. I can come up with something better than that…. Okay, here is a question, why is it difficult to generate questions for someone that you know for a very specific thing, that does not revolve around that one very specific thing? 11. Seeing how you were an attorney and have your JD, but you are also a creative drawing engine, what was your favorite course in your years and years of education? I loved all of my criminal justice and criminal law classes. 12. Since you are a bit of a celebrity to a tightly knit group of fanbois you understand, to a degree, what it is like to be sought after for attention and adoration, Who is a celebrity that you would love to meet? I really don’t see any difference between celebrities and “regular” people. Celebrity in and of itself doesn’t impress me. Intellectuals that have strong moral compasses and compassion impress me, celebrity or otherwise. 13. How often do people ask you to review their portfolio? Is that a common occurrence at Cons and such? Actually, I ask people to show me their portfolios. When I was trying to break in, a ton of industry folks helped me out and gave me advice, so I want to pay it forward, so to speak. 14. Any of the portfolios really stand out to you? Good or bad? Most portfolios that I see aren’t ready, but most could be ready with practice and determination. 15. What is the most interesting Con experience that you… umm… experienced (I am a wiz with the werds)? Wow, I’ve been to so many conventions and spent time with so many great people that it’s difficult to single out any one experience. I guess, in 2004 I went to Mega Con in Orlando as a total nobody, and I remember somehow finding myself partying at Tim Townsend’s house with Tim, Adam Hughes, Scottie Young, Brian Stelfreeze, Cully Hamner, and a bunch of other folks I sure I’m forgetting. Or maybe that wasn’t as memorable as one year in San Diego convincing Ten Tonners Reilly Brown and Kurt Christenson (with Kurt’s friend Tim and some random guy from Australia named Simon that we met at the hotel) to take a cab out to some stranger’s house party, then being stranded until the next morning because no cab would pick us up and drive us back. Or one year in Philadelphia where Heather and I got hammered and she asked a bunch of artists to draw fairies for her. So many good times from which to choose. 16. What was the last good book you read? Are there any TV shows that you can’t live without? What was the last good movie you saw? Man, I don’t even remember the last book I read, never mind good book. So busy. I don’t watch much TV anymore either, asides from children’s shows. Movies are the same, although I do try, even if I do watch it years after everyone else. Just watched Captain America, and I really enjoyed it. Not great, but I was impressed with the way they portrayed women. Refreshing. 17. I was born in Oklahoma City, Oklahoma. I grew up in Birmingham, Alabama. I went to college in Kent, Ohio. I now live in Columbus, Ohio. What is your geographic life path? I was born in Saigon, Vietnam. I grew up in Bristol/Portsmouth/Middletown, Rhode Island. I went to high school in Fall River, Massachusetts. Started college at Penn State, then transferred to Northeastern University in Boston. I went to law school at UPenn. I got my MBA at Saint Joseph’s University. I now live about 40 minutes outside of Philadelphia. 18. Okay, one really serious comic book question. What is it about sequential art that draws you in? I really enjoy the storytelling aspect of sequential art. I think I’m pretty decent as an artist, but I really take pride in my storytelling ability. 19. Anything else you feel I should know about you? You should know that I’m really private. 20. Any question you want to ask me? I went with “mmmmmpig” because, years and years ago, I needed to create a forum name on a long dead forum. I had just eaten a wonderful sausage sandwich and had uttered the “phrase” “mmmmm pig” a la Homer Simpson. That made me giggle so I created a forum name called “mmmpig.” I ported over to gmail and mmmpig and mmmmpig were taken… wtf?!?! So I settled on mmmmmpig, and the rest is history… a history of ham and bacon jokes. The joke is on everyone else though because I really love the porcine meat products. Thanks for the great answers Khoi!